You are then to secretly write a program in that language that computes the nth term sequence using only the bytes in the set. You will reveal the three pieces of information so that robbers can try to figure out the program. Answers will be scored by the number of bytes in the byte set with more score being good. Cracked answers have an automatic score of 0. If your answer is uncracked after one week you may reveal the intended program and mark your answer as "safe". Answers must be capable of calculating every term in the b-files of the sequence, but are not required to calculate any terms after. Sequences can be either 1 or 0 indexed for both cops and robbers. Here is a Python Script that checks if your code matches the given byte set. I made up my mind, I think I like t more than s.
Answers must be capable of calculating every term in the b-files of the sequence [...]. In this case, the b-file goes up to the 2000th number, which is way beyond what can be computed using Int. The sequence is the square numbers: 0, 1, 4, 9, 16, 25, 36, 49 ... (so that you don't have to check the link). Computes a(n) = n³ + n.
Another simple one, now again with enough letters to make it look like ordinary Haskell and maybe for you to amaze me by finding a solution completely different from mine. C (C99), A000005, 25 Bytes#, Cracked! These are the bytes for a full problem, takes n as a command line argument and outputs answer to stdout. 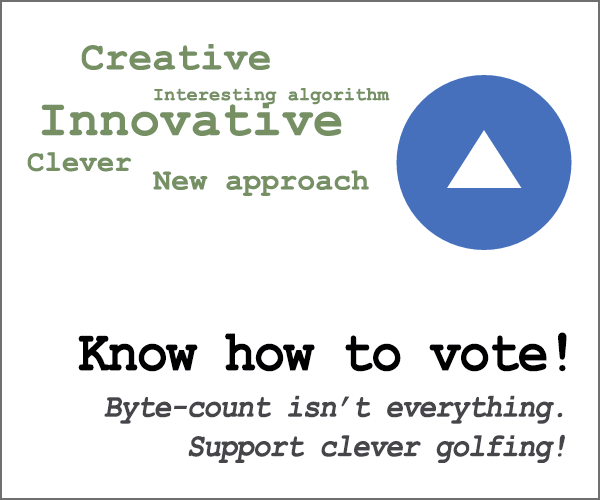 (Space is included in bytecount). Again, this is the simple square sequence a(n) = n2. It's cracked, and I won't start a new version, but if you want to play more: it's possible without y, and it's possible to be efficient. I apologize for leading you in wrong directions by giving a g. Let's do the same without! Again, remember that Int won't be enough to compute the 2000th Fibonacci number which is needed because it is in the b-file. I still hope I can make you rediscover my nice little observation. Note that there is no newline (but feel free to show a version which has them for readability) and remember that you have to be able to compute the 2000th Fibonacci number. I originally did this without .NSQ but I figured I could add them safely. This sequence is just "The Positive Integers". However, Cubix has three input commands, i, which reads in a single char (pushing -1 if input is empty), A, which reads in the rest of the input as chars (pushing a -1 to the bettom of the stack), and I, which reads the next number off the input (pushing 0 if there isn't a match). So naturally, I only provided i which reads in digits as their ascii value. uh-oh. Additionally, -1 is the usual marker for end of input, in conjunction with ? so I got rid of ?, forcing me to use ! (skip next instruction if TOS is not zero) for control flow. Finally, I thought I needed & to concatenate digits for printing with O (which outputs the top of stack as a number), but I realize now that that wasn't necessary either! i ) ! / u & ! ! i) : read input, increment. left: ;O. @ : pop top of stack, output as number, halt. !! : net zero effect, now we are at i) again. You shouldn't be able to brute force this one in a week unless you have a monster of a computer. Good luck! It's crackable. Just messing around to start off. Should be easy for anyone familiar with Ruby. It's a low score, but whatever. My code does not provide infinite output, but can compute the entire b-list. ... plus space, 0x00-0x1f inclusive, and 0x7f-0xff inclusive. Note that this uses a feature that I haven't pushed the documentation for yet, so I'll push that tonight, if you wait until then. (Or you can slop through my source code... have fun). Documentation pushed. Would be a byte less if a recent bugfix was on TIO. This is the Fibonacci sequence: F(n) = F(n-1) + F(n-2) with F(0) = 0 and F(1) = 1. If you can't tell, that Byte set includes a space. This should be moderately easy to solve. Let's try this without the l or o.
cat(diag(diag((a=scan()))%x%diag((a==a):a)),sep=''). diag is an interesting function, that can be used in three different ways. When presented with a single integer (diag(n)), it creates a NxN matrix with 1 on the diagonal. When presented with a vector (diag(1:n)), it creates an NxN matrix with the vector on the diagonal. When presented with a matrix (diag(diag(n))), it returns the diagonal as a vector. %x% computed the Kronecker product of two matrices, where each element in matrix 1 is multiplied with each element in matrix 2 separately. Doing this with a length n identity matrix and a 1:n diagonal matrix, creates a length n^2 diagonal matrix with 1:n repeated n times. diag extracts that again, and cat prints. Not the answer you're looking for? Browse other questions tagged sequence restricted-source cops-and-robbers or ask your own question.